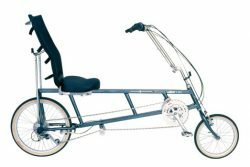 The Sun EZ-3 Tadpole SX recumbent trike is among the least expensive; most rugged and least stable tadpole trikes we know of. They are also among the heaviest and slowest tadpoles made and one of the most adjustable, fitting riders up to 300 lb with an X-Seam range of 36-46”. Though comfy for casual riders their handling can make them unsuitable for anyone who plans to ride over 10-15 MPH. 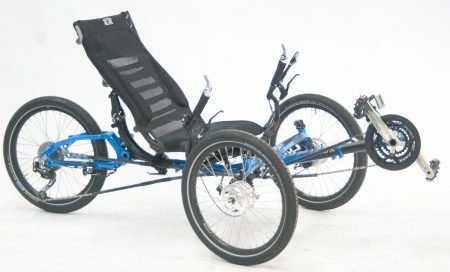 The Terratrike Rover has replaced the Sun Tadpole as our least expensive, heaviest tadpole trike. The Rover has a higher seat than the EZ-tadpole and a higher 400 lb warranty weight. 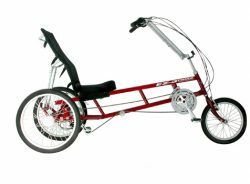 Like the EZ-tadpole it has direct steering and is not stable at higher speeds but can still be a suitable trike for casual riding. The unstable handling of the Sun Tadpole SX began with a steering redesign on the 2008 models. This 2008 “direct steering” version was quite unstable. Quality trikes with direct steering (i.e. 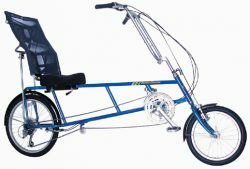 Catrike) can handle very well, the EZ-tadpole does not. We feel the redesign was rushed and poorly done, making the EZ-Tadpole unstable at speeds over ~10-15 MPH. They have since redesigned the steering geometry and improved it somewhat. Unfortunately, I don’t know an easy way to tell if a particular trike is the newer design. 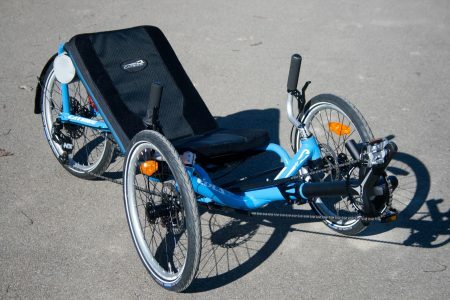 The EZ-Tadpoles are the lightest and lowest trikes Sun makes. The wide spacing on their dual front wheels gives a sort of go-cart feel in corners. 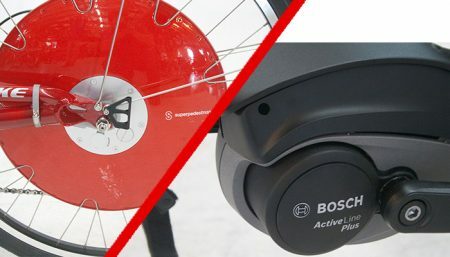 With up to 27-speeds you can even climb a hill on one of them and dual front disc brakes will stop you on the way back down. 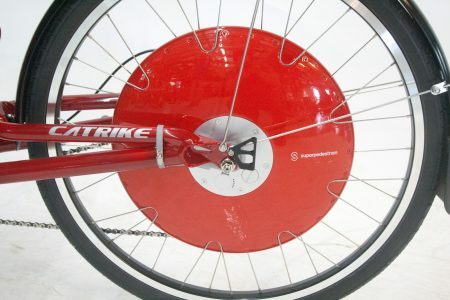 Be a bit careful to apply the two brakes together, it will pull to one side if you apply only one brake hard. Twist shifters and USS, not my favorite, I like Shimano bar con shift levers but to add these you have to get a Shimano rear derailleur too. A seat with a large well-padded base and a mesh back with adjustable recline. Dual front disk brakes so they stop well. A number of optional accessories are available: fenders, racks, seat bag, basket, etc. The seat height at 14” is on the higher end for a tadpole. This makes it easier to get into and out of but gives a higher center of gravity. To keep it upright in corners it has a wide track; you can tip it without trying, even at surprisingly low speeds. Pedal steer is noticeable when you are pushing hard, worse than on some other trikes. Their acceleration is sluggish, and climbing speeds are slow but you shouldn’t have to get off and push up a hill because the three wheels give stability even at 1 mph. If you are more concerned about comfort and low price than you are about speed you should try one of these before committing to buying it. NOTE: Sun does not allow us to ship their bikes to customers in the US. 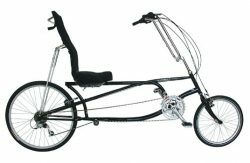 If you live too far away from us to come test ride and cannot find a Sun dealer in your area we could ship the Sun recumbent of your choice to most any bike shop near you for assembly. We usually can arrange to pay the shop for the assembly. 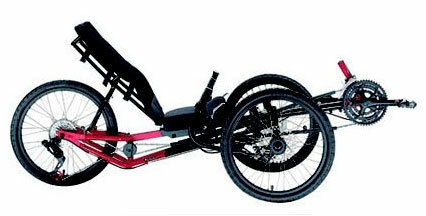 Click on the links below to read more about the SUN recumbent bike and trike models.